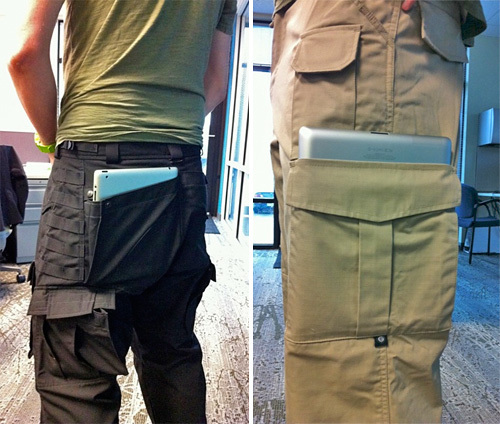 Tactical Pants Blog Searches For Pants With An iPad 2-Friendly Pocket | OhGizmo! Remember when Sony’s VAIO P compact laptops first came out and the company’s ad campaign tried to convince us they could actually be stashed in your back pocket? We all had yet another good laugh at Sony’s expense, but it turns out if their ad agency had actually done their homework such a premise was actually plausible. The Tactical Pants Blog set out to find a pair of trousers that could hold the iPad 2 which is significantly larger than the VAIO P, and while there was definitely no perfect solution, there are a couple of options believe it or not. The winning pair, Blackhawk’s Warrior Wear mens tactical pants are unfortunately discontinued, but they feature an enormous back pocket that could not only house the iPad 2, but also let the wearer actually walk around with it in tow. The 2 pictured above, the Kitana and Genuine Gear’s tactical pants scored a B and B- respectively in the blog’s testing, and while they were certainly able to carry the iPad 2 with minimal discomfort, you’ll have to give up any hope of being able to sit while one is stashed away. Hey- they finally made tablets portable. Too bad you look like a d’bag. I can’t wait for the pick pockets to start lining up.